Maria's Space: The Taliban Tried To Silence Her But At 17 & Now A Nobel Peace Prize Recipent, Malala Is Talking! The Taliban Tried To Silence Her But At 17 & Now A Nobel Peace Prize Recipent, Malala Is Talking! HE NAMED ME MALALA is an intimate portrait of Malala Yousafzai, who was wounded when Taliban gunmen opened fire on her and her friend' school bus in Pakistan in Swat Valley. The then 15-year-old teenager, who had been targeted for speaking out on behalf of girls education in her region of Swat Valley in Pakistan, was shot in the head, sparking international media outrage. An educational activist in Pakistan, Yousafzai has since emerged as a leading campaigner for the rights of children worldwide and in December 2014, became the youngest-ever Nobel Peace Prize Laureate. 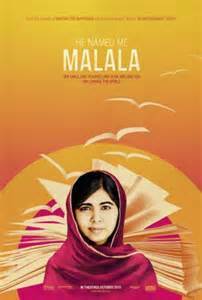 I know of Malala and find her fascinating. Her strength can probably be contributed to her father. His love and respect of her is evident and one that brings a tear to my eye. This story starts with Malala's attack and follows with her new life in England and her work as an activist which she has to balance with her education, family life and own values. We see Malala in her home, at her school, speaking engagements and traveling. I like the cartoon inserts that show her earlier life in story form. Very well done and it is my hope that schools add this to their curriculum or at least insert it into a class discussion. Our children are privileged and they should be made aware. My favorite parts are of Malala talking and acting like a normal girl. Watching her interact with her brothers and dealing with her father who is obviously an intelligent man yet can't get onto his own Facebook page showed the reality that we are all just people no matter where we come from. I am interested to see where Malala goes in the future. Will she continue to be an activist speaking out about education, woman's rights and more or will she fade into obscurity to finally live a normal life. Her fear of returning home because she is aware that she will be killed if she does is sad. Hopefully her future is everything she hopes for. Disclaimer: I received a complimentary copy of this movie for my honest opinion. No monetary compensation was offered.